Scorching summer heat is right around the corner in western North Carolina. If you like keeping things cool, or just want some shady adventure, here are some ways to beat the heat and enjoy outdoor adventures this summer in Lake Lure & the Blue Ridge Foothills, just 30 miles east of Asheville and the Blue Ridge Parkway. Check out these suggestions below or find more under the “Things to Do” or “Outdoor Activities” tab at www.VisitBlueRidgeNC.com. Whether you prefer water-skis, a wakeboard or simply a seat on the boat, cool off in Lake Lure, about 30 miles east from Asheville and the Blue Ridge Parkway. 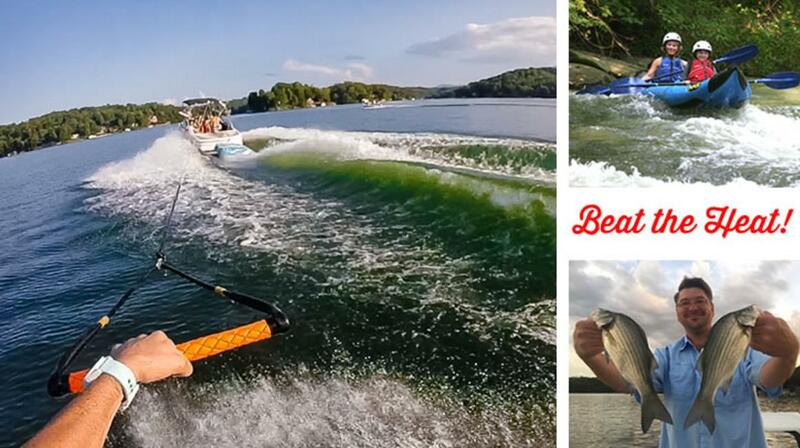 Hire a guide from Lake Lure Adventure Company to pull you and your crew waterskiing, wakeboarding or tubing. If cruising is more your speed, take a one-hour ride with Lake Lure Tours under a covered pontoon boat, or rent your own and explore the lake at your own pace. Kayaks, stand-up paddleboards and other non-motorized watercraft are also available for rent at both locations or when you stay at Rumbling Bald Resort. Visitors can also bring their own boat or watercraft, but a Town of Lake Lure permit is required. Call Washburn Marina for details at 828-625-1373. Dry off from your day in the water with a nearby zip line tour through the leafy canopy of Lake Lure’s Isothermal Belt region. Both Boulderline Adventure Programs and Canopy Ridge Farm offer ridge-to-ridge zip lining adventures to cool you off this summer. From Lake Lure to area rivers, our local fishing guides will show you the best spots to land a great catch. Join the Granddaddy Fly-Fishing Experience on a morning or evening fly-fishing trip for white bass and bluegill on Lake Lure, or down one of western North Carolina’s cool, mountain rivers for trout. For conventional tackle trips, check out Lewis, No Clark Expeditions or Rob’s Guide Service. Or, bring your own rod and tackle and fish along the shore of Morse Park in Lake Lure or CJ’s Carp Lake in Rutherfordton. Fishing licenses are required to fish with or without a guide. Call Washburn Marina for details at 828-625-1373. Take a seat at one of the Coastal Plain League’s premier stadiums and spend the evening cheering on the Forest City Owls, a collegiate, summer league baseball team. Grab a hot dog, some popcorn, and a baseball cap and take yourself out to the ballgame! Visit the Forest City Owls at McNair Stadium in downtown Forest City and afterward peruse the town’s quaint mom-and-pop eateries and shops. Strolling through shady trails will take you out of the heat and give your heartbeat a boost. Try the Donald Ross Nature Trail Park in Lake Lure or the Purple Martin Trail in the nearby town of Rutherfordton. Both trails offer just over two miles of easily traveled surfaces great for walking, hiking, or running. Expand your horizons and check out the winding, canopied trail to Chimney Rock State Park’s Hickory Nut Falls, where you can cool off in the spray! Dogs are welcome. The Broad River Paddle Trail is 42 miles of class I/II paddling and tubing adventures! With three access points, the river is broken into three sections allowing you to choose your endurance level or tackle the full stretch. Hire a professional kayak guide, rent tubes or bring your own gear. Pristine, rolling courses welcome you in Rutherford County. Cleghorn Golf & Sports Club in Rutherfordton was designed in 1922 by famed golf architect George Cobb, known for his Par 3 course at Augusta National. Rumbling Bald Resort in Lake Lure offers both Apple Valley Golf Course and Bald Mountain Golf Course, but both have a Golf Digest rating of 4 stars! You can find the complete list of golf courses on page 6 of the travel guide. Enjoy a nice lunch on the grass under the trees in Chimney Rock Village before strolling the banks of the Rocky Broad River and shopping all the local treasures on Main Street! You can even get something to go from a must-eat area favorite if you don’t feel like packing your own basket. Beat the heat this summer with these western North Carolina adventures and more. Turn your visit into a vacation and book a mountain cabin, lakefront hotel, riverside campground, or B&B in Lake Lure & the Blue Ridge Foothills. Explore our website to learn more!